Well, my training has actually started. 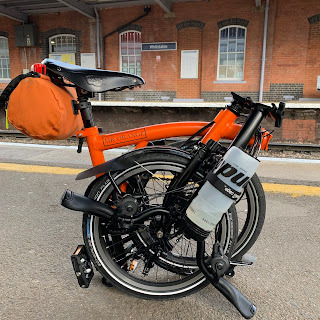 I would like to think that when we reach the other side of the Brompton World Championships I will keep this up as I intend to go on a great deal more organised and impromptu cycle rides. Today I simply headed off into central London with no particular route planned but just a vague idea of where I wanted to go and more importantly avoid. I took my Raw Lacquer S2L. Passing Marble Arch I could see that the preparation for the marathon race was well under way, despite it being so early. There really is a buzz in the air in London at the moment. I thought that London would be deserted at 06:00 but believe me it wasn't. There were large numbers of tourists out, taking photos of London landmarks, themselves and my Brompton folding bike. I was not alone cycling. The success of our wonderful cycle team has perhaps helped to induce people to get out on their bikes. Lots of Team GB cycling gear was on display on all manner of bicycles. This can only be a good thing however I hope that the infrastructure for safer cycling is also a legacy of these Olympic Games. What I must do now is try and sustain this training. I am doing it for the Brompton World Championships but the reality is of course that with less than two weeks to go, nothing I do from now until the big day is really going to make much of a difference. As I alluded to at the start of this blog, my real hope is that I will be able to sustain a healthier regime beyond the greatest cycling event of them all. You are in a win-win situation, whether or not it helps you win the Brompton Tournament. Cycling is a great, healthy alternative, as you have pointed out.